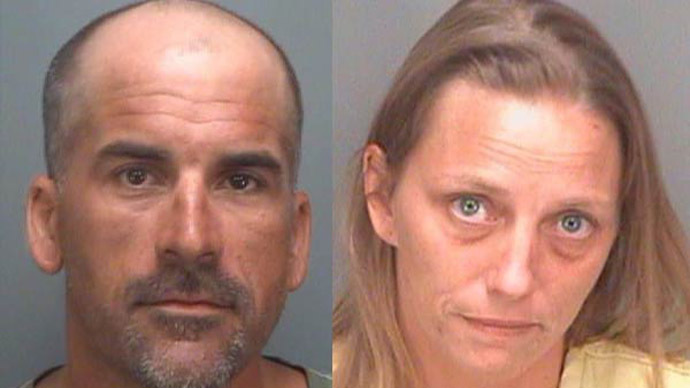 A couple from Florida has been arrested after allegedly using cannabis and cocaine to bribe their kids into cleaning their rooms. Joey and Chad Mudd admitted to the police they had regularly offered their children drugs to persaude them to do "household chores" and for “exceling at school,” Gawker reported. The police report, published on The Smoking Gun website, also stated that Joey, a 34-year-old mother of two daughters aged 13 and 14 and another pre-school child, willingly admitted to smoking weed with her teenage kids at least five times. Charges brought against the father mention that Chad, 36, snorted cocaine with the teenage kids in his truck in the parking lot. The kids were given drugs at the family’s home in Largo, a city 20 miles from Tampa Bay. Both parents face several felony child abuse charges. The children, including the couple’s third child, in pre-school, are now with a family member. Mudd, who is reportedly a pediatric care worker, was later released from the Pinellas County jail on a $5,000 bond, and has been ordered to avoid contact with her children, according to The Smoking Gun. Chad Mudd, a restaurant employee, remains behind bars on six counts of child abuse and cocaine possession.